Last week’s Pic’ of the Week (26.01.19) is by way of celebrating the achievements of Wendy Waddell. Wendy joined BPRC in July 2017 to support her then six-year-old daughter, Pippa. Starting out in the 800m, they soon became admired by everyone in the club for taking part whilst defying Pippa’s struggle with a heart defect. Despite all the hospital appointments she went through, she always maintained a happy, smiley face showing to all that she would never give up. 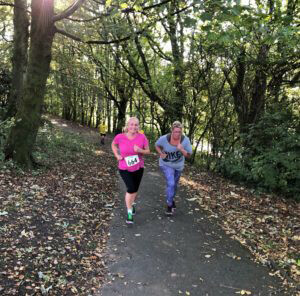 Since then, Wendy and Pippa have moved up to the 1.5K distance, and more recently Wendy, building through the 2.2K, became a regular entrant in the 3.6K. Wendy also trains with friends in the back lanes of Cheddleton on parts of the Christmas Pud route. 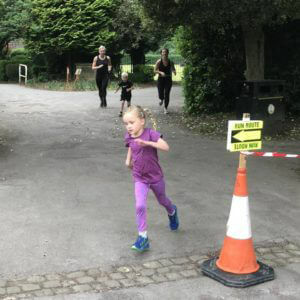 Then last week, Wendy achieved her first 5K in a sub-45 minute time of 44.08. To celebrate her achievements, on the same day, Wendy agreed to represent BPRC by being interviewed on Moorlands Radio alongside GB OCR representative Jason Burgess. This week’s pic-tures of the week show the relationship between siblings Bleu (5) and Oliver Bailey (10). Both starting in the second wave, Bleu and Oliver compete against each other over different distances – Bleu in the 1.5K and Oliver in the 2.2K – to see who comes first. This competition has lasted for nearly a year and recently, things are hotting up! Bleu has overtaken her brother twice, both a few weeks ago and this week. Something to watch over the coming weeks. 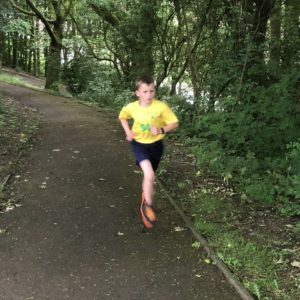 After starting to train with Staffs Moorlands on Tuesday evenings, Lucas was keen to step things up and take part in local events; so he came to BPRC. Lucas has taken part in every event since joining twelve weeks ago. He has often won in his regular 2.2K events and earned a pb of 10.16 a few weeks ago. After each event, he prefers to wait in anticipation for the publication of the results for his time, rather than look at the finish line clock. Whenever we have spoken to Lucas, his enthusiasm and dedication are more than impressive. Which just leaves us wondering: just how much further will he go? BPRC. Since joining BPRC in April, Paul Cope (V45) has come a long way since his first Wednesday evening five-kilometer runs. After a dead 30.00 finish in May, he went on to break the 30 min barrier the following month, finishing in 29.07. Successive runs since then have seen him whittle his time down to a 26.50 PB in September. Then a calf injury saw him pull out of a couple of runs only to bounce back in the last two weeks to challenge his PB again. Recently, Paul and fellow member Rich, who ran a half for the first time, completed the Manchester Half Marathon and both gained respectable times of 2.06 and 1.58 respectively in rather gloomy wet conditions. Paul also takes part alongside his family. Wife, Mara, who when not escorting their daughter Ellie (4) along the 800m, recently moved up to the 3.6K distance. 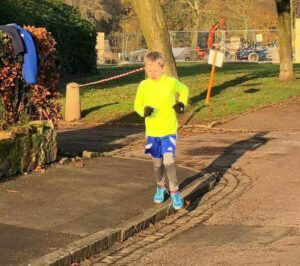 This week also saw son, Harry (6), also excel with a 12.13 PB in the 2.2K distance. Paul’s mother, Zena (V70), was also a most welcome regular attendant in the 800m. 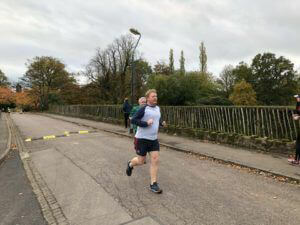 Paul and several other club members will be taking part in the Cheddleton Christmas Pudding 10K in just over two weeks time. An event many members look forward to each year. This week’s pic of the week is by way of celebrating the recent achievements of Louise Hackett. Fourteen-year-old Louise is a regular entrant for us, mostly running in the Wednesday training sessions and we thank her for marshaling for us on occasion. 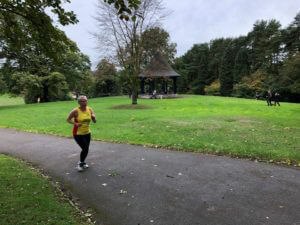 In the previous (29/09) week’s event, being paced by her trainer Gareth, Louise gained the course record of 20.08; some thirty seconds faster than that set by Kerry Marchant. 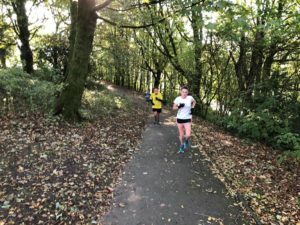 This Tuesday (09/10), she went on to win the Staffordshire Moorlands Inter-Schools Cross Country Championships at Birchall, Leek, in her age category. Both of these achievements come on top of a 9th place in the Sutton Park Relays on 22/09 just showing how far she is progressing. Additionally, the Inter-Schools XC championships also saw two other BPRC members perform extremely well: Sienna Phillips (12) and Harry Bond (14) finish 4th and 2nd respectively in their age categories. We eagerly await the next stages of their progress. Where will they go further? 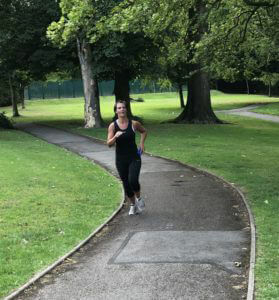 The pic’ of the week this week is by way of praising Dan Bartram (V40) on her step up to our 3.6K distance, a milestone completed to the 5K. 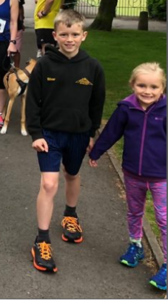 Dan initially joined BPRC with her spouse Gary (V40) and children, Marlie (6) and Archie (11) as part of an initiative to get the whole family fitter and have been attending whenever they can. It seems now that she also progressing up the distances. 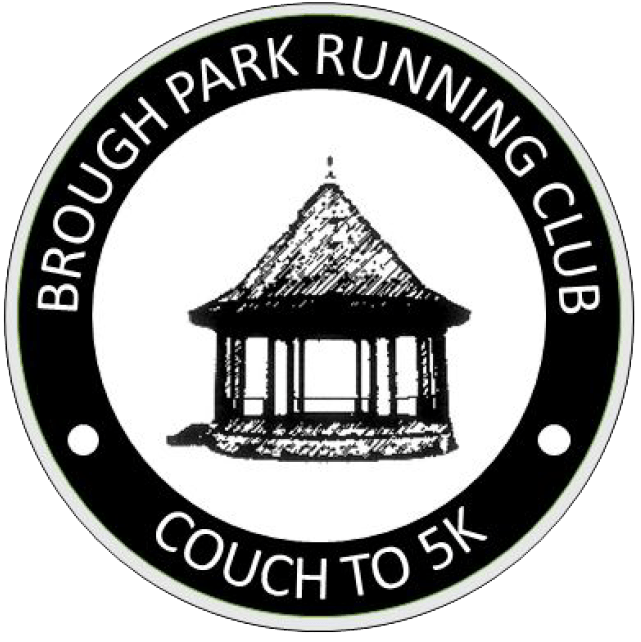 Hi, once again from the side-lines of Brough Park Couch to 5K and Beyond. 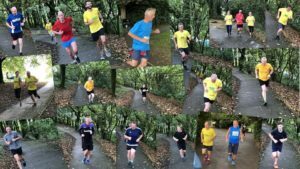 The pic’ of the week for the 15/09, third Birthday event, is by way of congratulating all the two-dozen entrants who took on the Killer 10K. 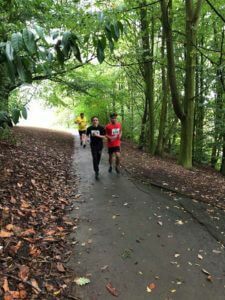 There were 16 newbie’s to this course in addition to 10 who completed the event last October that found the strength of mind and body to take on one of the toughest routes in the area, if not the region. Many of those who completed the previous event gained an improved time, which shows how they have developed. We welcome the young and not so, the fit and the unfit; not everyone can move on to what these achieved; however, everyone is encouraged to attain their own goal. Thomas Turner (16) signed up to BPRC in July, entirely on his own, after sitting his GCSE exams. After taking part on several occasions, this week he introduced his friend Michael DeBelen (16) around the 5K course for the first time. 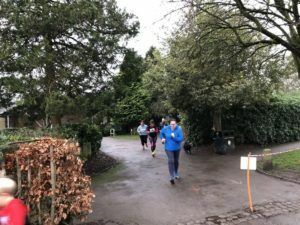 After all the stress of the exam period, coming to an open, friendly, not-so-competitive event like ours can only help clear the head and get some fresh air away from the desk. And bringing your friends has added bonuses too. Now that Tom has finished his exams, we would like to congratulate him and we hope he continues to do well in the future. BPRC.